When it comes to roofing, many homeowners always have many questions regarding the kind of material to use. 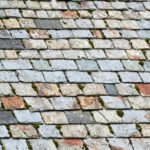 However, what many homeowners do not know is that slate is the best roof to consider, but often overlooked because its capabilities and value are unfamiliar to them. Others consider them as old fashion because of some of the oldest homes in the country. Before you choose slate roof, it is wise to consult a professional roofing contractor. By doing this, you will get to know much more about slate roofs. However, in a nutshell, they are long-lasting shingles on the market today. Furthermore, they are prized for its beauty and longevity. Slate roofs have many benefits, however, we are only going to look at some of the main ones. One of the main benefits of investing in the slate roof is that they are extremely durable. In other words, they are built to last. As a matter of facts, you cannot compare slate with other roofing material because others have been designed to last for a few decades while slate is built to last for a century under the right condition. As a matter of fact, it has been proven that if installed correctly by a professional, these roofs can still remain structurally sound for over 150 years. Another slate roof benefit is that they are extremely fire-resistant. As a matter of fact, they are among the leading fire resistant materials available today on the market. Unlike asphalt shingles and wood, slate tiles do not burn. This is a big plus to homeowners. Slates are also attractive and the best for those looking to remodel their property. They are not only stylish but offer aesthetic value. This is because slates roofs are made from a natural stone product, which comes from a metamorphic rock. This is what creates their unique attractive appearance. The good news is that the material is available in a wide variety of colors, which makes it possible to match a particular style and exterior color palette. The most common colors are blue-gray, pure gray, and black. However, they can be found in green, red, and purple. The moment you have installed them; slate roofs require little care. As a matter of fact, the only attention it needs is professional roof inspection, which is conducted after every one or two years. Furthermore, if any roof tile breaks or becomes damaged, repairs are fairly easy by a licensed professional. Thank you to the Roof Restoration Sale team for the article.